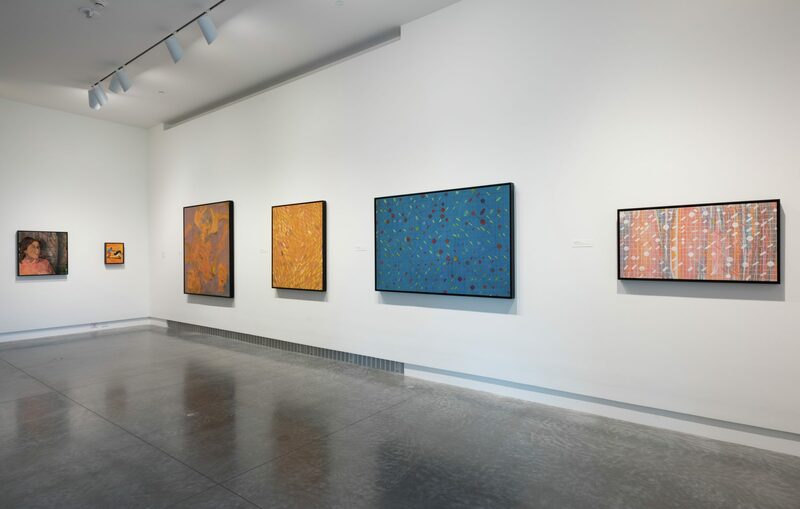 It is not faint praise to describe the fifty-year retrospective exhibition of multimedia artist Howardena Pindell as wholly satisfying. What has until now seemed an incomplete assessment of the artist’s standing within the development of contemporary art has been synthesized into a presentation that neither privileges her role as artist activist nor her formalist experimentation but reveals the inextricable relationship between the artist’s biography and her studio practice. Both the exhibition, What Remains To Be Seen, and the accompanying eponymous catalogue elevate Pindell’s work to a place that should be regarded as pioneering. From her position as the first African American curator at the Museum of Modern Art (MoMA) to her early adoption and free utilization of postmodern practice, Pindell is defined as one of the most important artists of our time. The exhibition curators—Naomi Beckwith, the Marilyn and Larry Fields Curator, Museum of Contemporary Art Chicago, and Valerie Cassel Oliver, the Sydney and Frances Lewis Family Curator of Modern and Contemporary Art, Virginia Museum of Fine Arts—suggest that Pindell’s early activism was a significant factor in her limited popular acceptance. It is no accident that she and Conceptual artist Adrian Piper, herself a pioneer in investigating the intersection of Kantian philosophy with race and gender, are only now receiving major retrospectives; however, as the curators aptly declare and adeptly demonstrate, their project “isn’t pure revisionism for the sake of canonization.” They instead endeavor to describe Pindell’s career as a model for contemporary practice. To accomplish this, they have structured the installation as a call for and a response to the artist’s personal narrative and intentionality. The result is a concentrated consideration of how motivation informs outcome and vice versa, as we come to understand that Pindell is engaged in a dialectic with herself and the larger art community. The exhibition at the Virginia Museum of Fine Arts (VMFA) is installed in two galleries: the Evans Court Gallery and the 21st-Century Gallery. They are located some distance apart, yet the walk from one space to the other does not diminish the impact of the exhibition. It instead provides the curators an opportunity to amplify their three objectives: to explicate Pindell’s studio practice, to establish her role in the advancement of contemporary art, and to suggest the range of the artist’s social commentary. What becomes discernible is that from whatever point one enters into the exhibition, and regardless of the scale the artist is working in, Pindell’s works should be viewed as both heroic and meditative. The obsessiveness seen in Untitled #58 (1974; Collection of James Keith Brown and Eric Diefenbach, New York), a small work measuring 5 by 8 inches, is reiterated in the immense (86 by 103 inches) Feast Day of lemanja II December 31,1980 (1980; Studio Museum in Harlem, New York). These works, along with others in the exhibition, have a tactile quality represented by a pictorial space that is heavily impastoed with paint, stitching, paper, sprinkles, adhesives, and other collaged material that imply fragility but in fact are physically durable. These elements afford the work a sculptural presence such that one experiences it, no matter the size or medium, from several vantage points—superficially, from above, and from below. The installation in the 21st‑Century Gallery progresses chronologically, both in terms of the artist’s biography and her studio practice. It is divided into five sections based on her pre- and post-1979 practice. Pindell enrolled in the Yale University MFA program in painting in 1965, as a figurative painter working with a Fauvist palette. But by 1967, when she graduated, she was a Color Field abstractionist. The first few works in the gallery attest to that progression. The subsequent transition from figural work to Minimalism was precipitated by her inability to work in her studio during the day once she relocated to New York from New Haven. Space Frame #3 (fig. 2) exemplifies the artist’s experimentation and resulting transformation from a colorist sensibility to a considered minimalistic formalism. Pindell’s paintings, however, lack the rigid architecture evident in the work of such contemporaries as Sol Lewitt. Instead, in mapping three dimensionality onto a two-dimensional surface, Pindell’s approach can be read as an attempt to reconcile the rational with the irrational. In Space Frame #3, there exists a perceivable airiness that causes her circles to strain against the control of the formalist grid. This propensity for openness is also evident in her Video Drawings, begun in the 1970s, as well as her more recent Space Drawings. Longtime friend and colleague Lowery Sims describes Pindell’s tendency as a quest to reconcile structure and automatism. The duality in her painterly approach is mirrored in her personal life of the period. Pindell began working for MoMA shortly after graduating from Yale. Her position in the curatorial department made her—an African American painter—both an insider and an outsider unable to fully criticize the institution that failed to adequately include artists of color and women in their ranks. As a cultural worker and activist, she was further alienated from the margins, unable to find acceptance among black and feminist artists who mistrusted her because of her curatorial role. 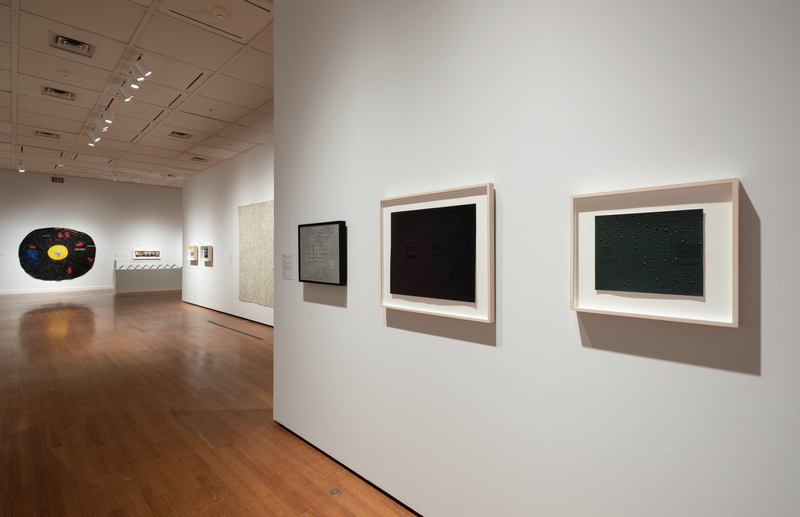 In the center of the gallery, the curators offer a timeline of Pindell’s career in relation to important world events from the year 1979—the return of the Ayatollah Khomeini after a fifteen-year exile, the overthrow of Ugandan dictator Idi Amin, and the discovery of the rings of Jupiter. The year was equally significant for the artist because she resigned her position as associate curator at MoMA to become an associate professor at SUNY Stony Brook. Shortly after beginning her new job, Pindell was involved in a near-fatal automobile accident and suffered brain injury and memory loss. The incident led Pindell to begin two important bodies of work, her Autobiography and Memory series. After the accident, some things remained consistent. She continued to vary the scale of her work. The open, middle ground remained a signature aspect of her compositions, and color continued to play a prominent role. There were also decisive shifts in her approach, the most telling of which was the introduction of descriptive titles and the reappearance of the figure. The Autobiography series takes two forms: small, intimate constructions that are personal recollections of her life history, and monumental, ornate, politically motivated canvases. In both forms collage becomes an important element. To stimulate her memory, the artist turned to postcards previously sent to friends and family as well as photographs taken on her many trips. She cut them into strips, spaced them out, and then painted the interstitial spaces as a metaphoric act of reconstitution. Works such as Autobiography: East/West Bamboo Forest (1983; Newark Museum, New Jersey) are expansive and fanciful and establish new associations between image and context. In the larger stitched canvases such as Autobiography: Air (CS560) (see fig. 1), the artist’s body appears and disappears. Pindell says that these works were inspired by the death of her friend, artist Ana Mendieta, who fell from a window. In a recent gallery talk, Pindell suggested that because Mendieta landed on a rooftop, the police were unable to draw a chalk body outline. The reality of this fact, coupled with her own accident, caused her to consider her body in relation to her overall identity as a cultural worker. It is as if Pindell, untethered from any institutional constraints of MoMA, decided to let the work speak, and, along with collaged elements that included her own blood, she began to incorporate text into the work. In the Evans Gallery, where the museum typically installs its temporary exhibitions, one finds an in-depth consideration of the artist’s technical development. It opens with Untitled (1968–70; Mott-Warsh Collection, Flint, Michigan) a soft sculptural grid that recalls the sagging felt pieces by Robert Morris from the late 1960s. What becomes clear in the presentation is Pindell’s penchant for simultaneously working on multiple ideas. Her medium and studio practice are utilized to consider the very notion of art making and the nature of the art object. The black Grid Studies and Removal 3/8 constructions (fig. 3), also presented in the gallery, demonstrate Pindell’s move away from her Color Field grids on paper to consider an antithetical position. Although devoid of color, they possess the same spatial interiority of the colored work. The flatness of the black field is interrupted by the addition of texture, thereby denying the possibility of the empty void. The placement of her black works directly across from the Video Drawings clarifies the consequence of using varied media to investigate the quality of light across a pictorial field and its ability to move from two to three dimensions, and in so doing, engage in a social discourse. When the exhibition shifts from a technical discussion to a thematic one, blackness as form shifts to blackness as social discourse. Her iconic video work, Free, White and 21 (1980; Courtesy of the artist and Garth Greenan Gallery, New York) and large mixed-media works such as Diallo (2000; Courtesy of the artist and Garth Greenan Gallery, New York) are included in this section. In these works, the artist tackles gendered racial violence. In the case of the early video, she is addressing white supremacy and censorship experienced in the feminist movement, and in the latter, police brutality against black males, another form of racial terrorism. The full-color catalogue contains essays by Beckwith and Cassel Oliver, as well as entries by Lowery Stokes Sims, Brian Wallis, and Conceptual artist Charles Gaines. Their analyses of Pindell’s work and its relationship to the development of American postmodern art makes the publication more than simply a compendium. A highlight of the text is a roundtable discussion with the two curators and Conceptual artists Marilyn Minter, Lorna Simpson, and Molly Zuckerman-Hartung. Together they discuss Pindell’s iconic work and the way her contribution to the field has influenced their process. This conversation fulfills the curators’ ultimate goal of making Pindell’s career the model for contemporary art practice. 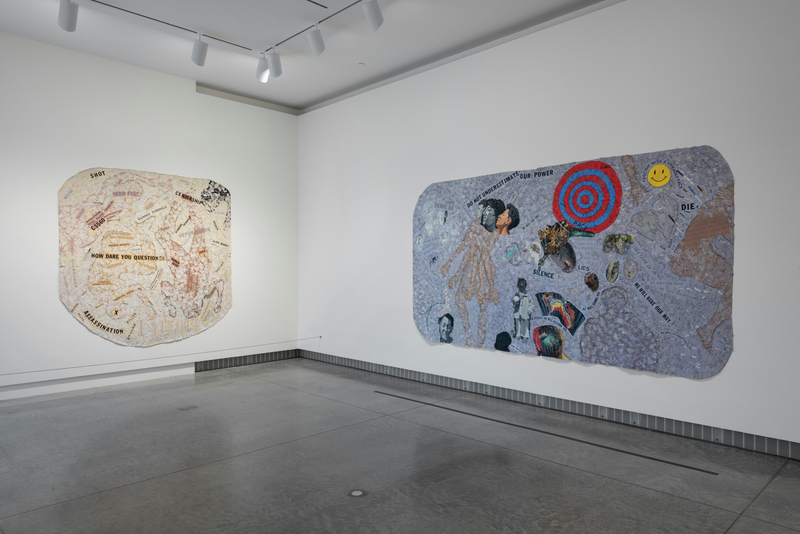 Cite this article: Andrea Douglas, review of Howardena Pindell: What Remains to Be Seen, Virginia Museum of Fine Arts, Panorama: Journal of the Association of Historians of American Art 4, no. 2 (Fall 2018), https://doi.org/10.24926/24716839.1677.